Are you the parent of a young male child who would like to join the Boy Scouts? Or, is your child already a member of a local Boy Scouts Den who is looking for more information on the organization that they are a part of? If so, you may find some of the following Boy Scouts facts interesting and well worth the read. The Boy Scouts of America welcomes participation from all boys, typically between the ages of seven and twenty. This is done through different membership levels, such as Cub Scouting, Boy Scouting, and Venturing. In addition to welcoming school aged boys of all ages, the Boy Scouts of America also welcomes those with disabilities, including mental and physical disabilities. While the goal is to treat all boy the same, some Den Leaders may make special accommodations or adjustments for those with disabilities. While a large number of Boy Scouts do so through local groups and councils, not everyone is provided with the same luxury. There are a number of boys who wish to join this well-known organization, but can’t. Whether that reason is for transportation issues, weather, or isolation, the Boy Scouts of America has a plan. That plan is referred to is known as the Lone Scout Plan. Loan Scouts will be updated on nearby activities, which they may wish to join in on. They will also be provided with, through mailings, a list of at-home activities that are ideal for Lone Scouting. Boys’ Life is a magazine that is commonly referred to as the main publication for the Boy Scouts of America. The Boys’ Life Magazine comes in three different versions, ideal for Boy Scouts of different age groups. If your child would like to learn more about the Boy Scouts, as well as fun activities that they can do on their own time, you may want to get your child a subscription to Boys’ Life. All Boy Scout members receive a discounted subscription price. Robert S. Baden-Powell, Ernest Thompson Seton, Daniel Carter Beard, William D. Boyce, and James E. West all had a hand in founding and organizing the Boy Scouts of America. This is according to the official website for the Boy Scouts of America, which can be found with a standard internet search. In 1914, Robert S. Baden-Powell developed the Cub Scouting program, which is designed for younger boys. Today this division is one of the most popular and active ones! Merit badges have become a staple of the Boy Scouts. In fact, merit badges are one of the first things noticed on a Boy Scout uniform. 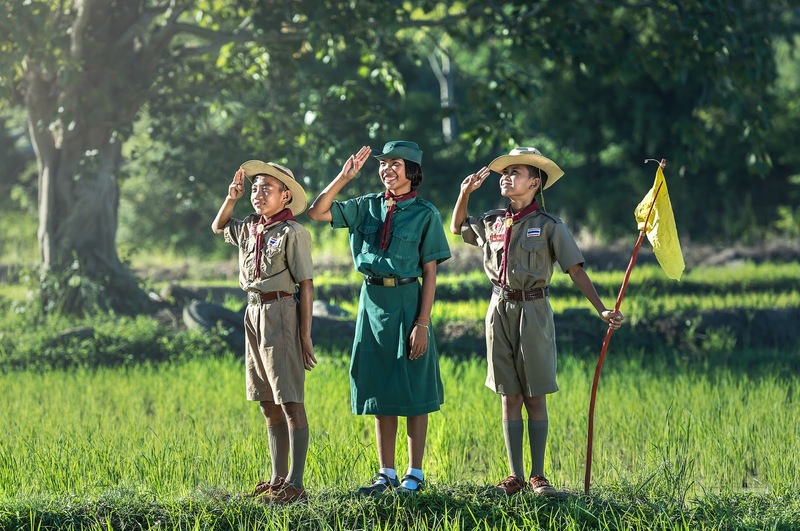 Merit badges are awarded to all levels of Boy Scouts, including those in Cub Scouting and Boy Scouting. There are over one hundred and twenty merit badges that can be earned by Boy Scouts overtime. These merit badges often require the completion of specific activities, such as camping, home repairs, or nature. The above-mentioned facts are just a few of the many that you may find interesting, concerning the Boy Scouts of America. In fact, there are so many interesting facts that you could examine that it could take you hours on end to do the research. With that in mind, if you do have a few hours, you and your child may want to visit the online website for the Boy Scouts of America. Your child may enjoy learning more about the organization that they know and love.